Elliott-Lewis gives back to its community in many ways. Each year, a group from Elliott-Lewis participates in the Ronald McDonald House telethon and the Company makes a substantial contribution to that charity. 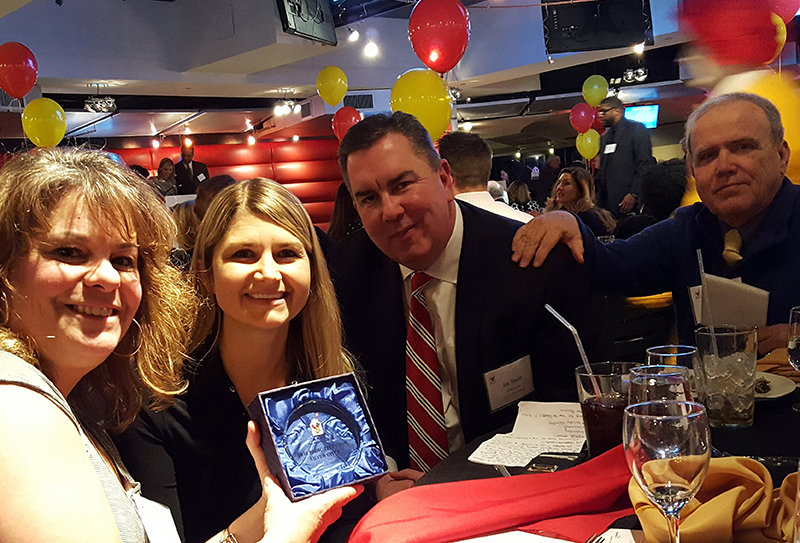 The results of the Company’s contributions to Ronald McDonald House took on a very special and emotional meeting at the Ronald McDonald House Thank You Event for its sponsors, which was held at Citizens Bank Park this year. The Elliott-Lewis contingent, made up of Karen Sinko, Joe Smith, Fran McDonald and Andy Detterline (behind the camera) had the honor and the pleasure of having dinner with Becca Coyle (center). Becca, who is from Brooklyn, was the featured speaker at the event. Her twins Logan and Riley arrived nearly three months early last May, weighing in at just 1.8 and 2.5 pounds. Becca and her daughter Riley have been living at Ronald McDonald House since August, shortly after her son Logan was medivaced to CHOP. Dad Jeff joins them each weekend after putting in a grueling work week as a first-year associates with a NYC law firm. Their dog, Chrissy, is in foster care that Ronald McDonald house helped them find until both twins can come home. This eloquent, upbeat young mom moved the crowd to tears as she recounted all that Ronald McDonald house has meant to her on her young family’s difficult journey. The dedicated directors and staff at Ronald McDonald house could have found no better spokesperson to demonstrate how well the sponsors donations have been spent. Elliott-Lewis crew counts themselves very, very lucky to have been chosen to have the opportunity to get to know her even better.